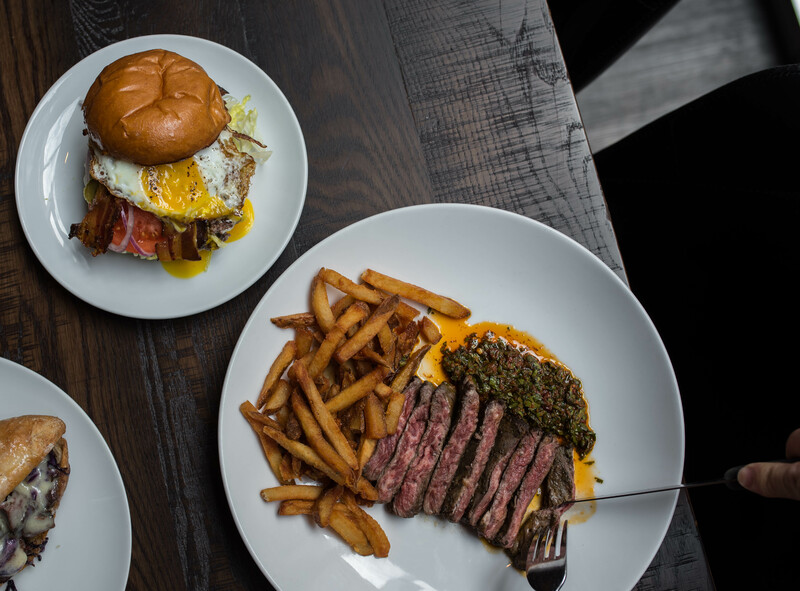 The lunch menu at The Partisan is straight fire, guys. Located on 709 D St. NW in Penn Quarter, their sandwiches will blow you away, like we’re not exaggerating. They’re “joined at the hip” with Red Apron, a bamf butcher shop, and they have some of THE best meat we’ve ever tasted. We hit them up for lunch the other day, and the restaurant was packed by 11:30. 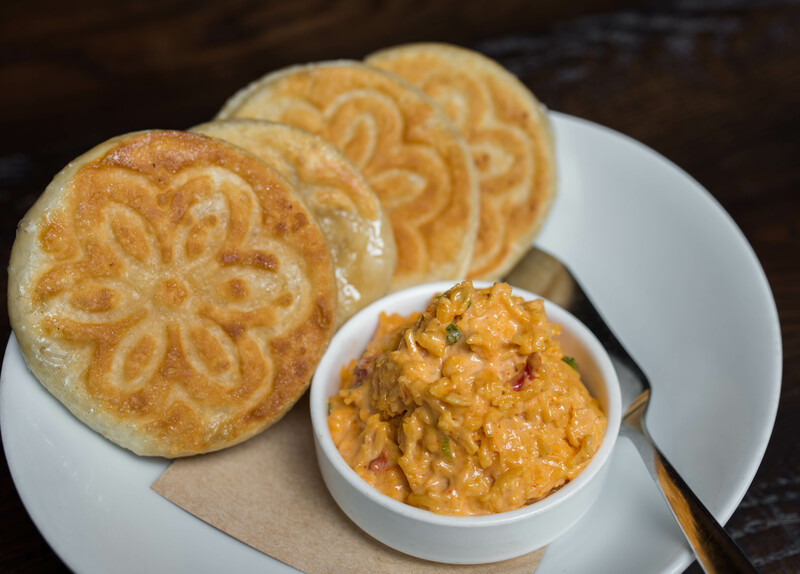 We started our meal off with their Pimento Cheese ($9) appetizer, and the presentation was beautiful. The griddled tigelles were almost too pretty to eat, but we quickly got over that and devoured them with gobs of pimento cheese spread. We would’ve gotten a charcuterie board as well – Red Apron charcuterie is stupid good – but we indulged not too long ago at Bluejacket so we decided to be good and pass, ha. Definitely make sure to get a board to share though, especially if you’re planning on enjoying dranks with friends. SEE ALSO: United Tastes of America: Washington D.C.
Then we got two sandwiches and an entree to share because we like going all out. We’re gonna start with our absolute favorite because we feel like it, so here goes – their hot wagyu pastrami sandwich ($12). This is basically what went down: we took one look, fell in love, took a bite and then died because our taste buds went to food heaven. 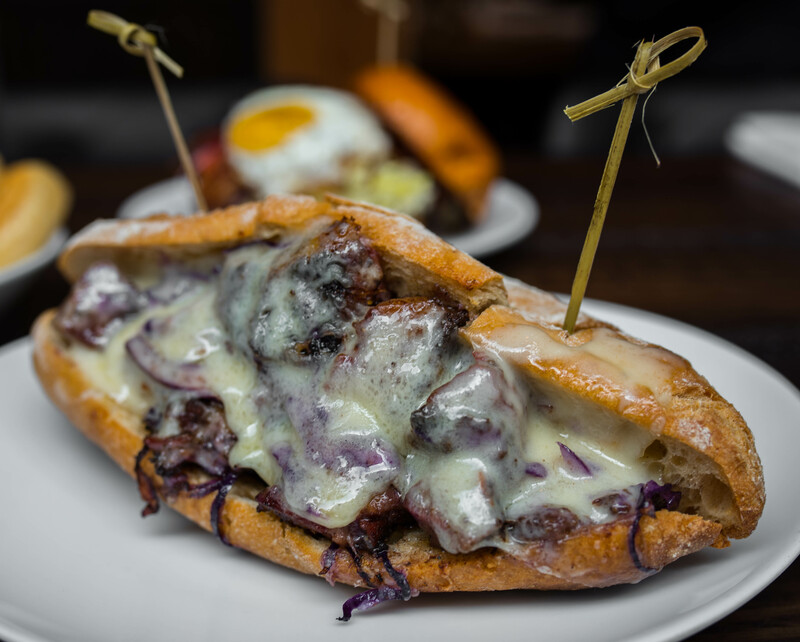 This massive sandwich is quality at its finest – a crunchy french baguette with huge chunks of smoky, melt-in-your-mouth pastrami, red cabbage slaw, island sauce and melty swiss cheese. We have no words, friends. We can’t even begin to describe the deliciousness we experienced so you guys need to go STAT so we can rave about it together. Then we got their Red Apron Classic Burger with bacon and a fried egg. Not gonna lie, we were on the fence about the egg, but we went for it because we wanted to take a badass pic of the yolk dripping, ha. 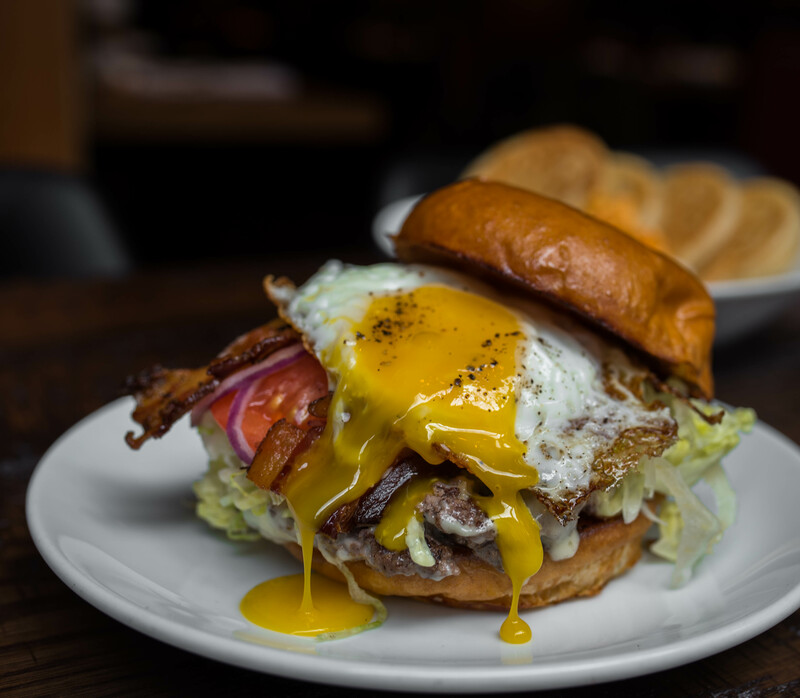 The burger itself was $11 (Came with american cheese, tomato, iceberg lettuce, island sauce, onion, and pickles), but the bacon and egg were extra! If you’re in the mood for a solid burger, definitely indulge because they can deliver, but if you’re feeling a bit more adventurous, we recommend getting the Chorizo burger instead. It’s more flavorful in our opinion, and it’s definitely unique with it’s chorizo patty, smoked chimichurri, avo, pickled onions, sour cream and challah bun. Which one sounds better to you? Let us know by commenting below. And last but not least, their steak frites. We probably wouldn’t get this again for lunch because their sandwiches were so damn good, but this was solid for sure. The meat was tender (as can be expected), and the accompanying chimichurri was yumtastical. Although we ingested an obscene amount of food, we were craving sweets so we decided to split a dessert. 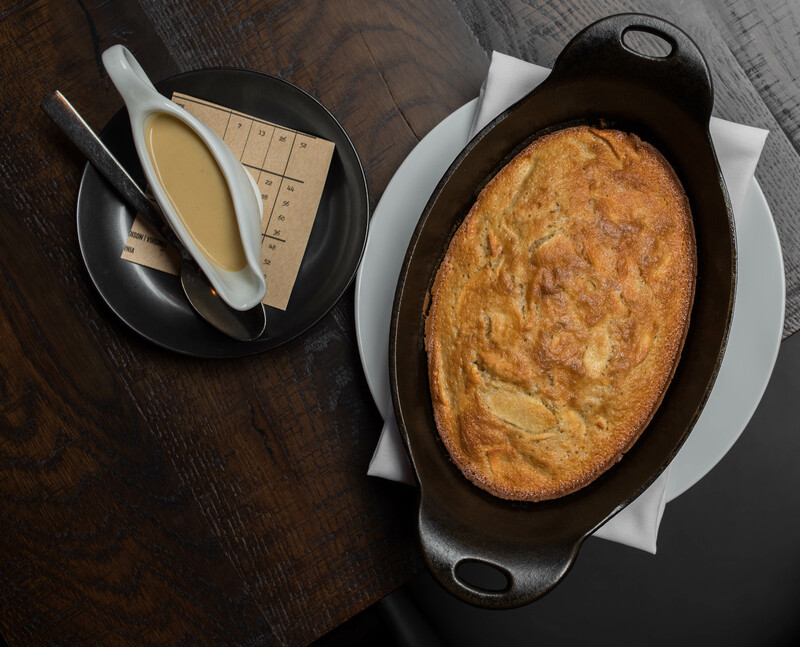 Janelle, their wonderful manager, recommended their apple dutch baby so we went with that. It’s made to order so it takes about 10-15 minutes, but friends, it’s SO worth the wait. It comes out piping hot from the oven, and it’s big enough to share between 2-3 people. We just wished we ordered a side of ice cream because that would’ve been the cherry on top…because who doesn’t like that hot/cold contrast? So, what did you guys think of The Partisan? Have you been yet? If not, we sure as hell hope it’s on your list now! Definitely let us know what you think of our recommendations when you go, and make sure y’all check back on Thursday for fresh new content. For more DC foodporn, browse THIS tab.